February is known as the month of love because of, of course, Valentine's Day. I personally love this holiday because its an extra excuse to go out to a nice dinner or treat ourselves to a date night. And who doesn't love celebrating love? 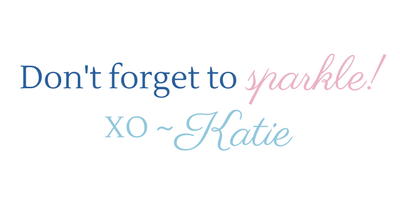 This year I wanted to step it up a notch too though and make February the month of self-love and self-care. And I want all my friends (i.e. YOU!) to join me! 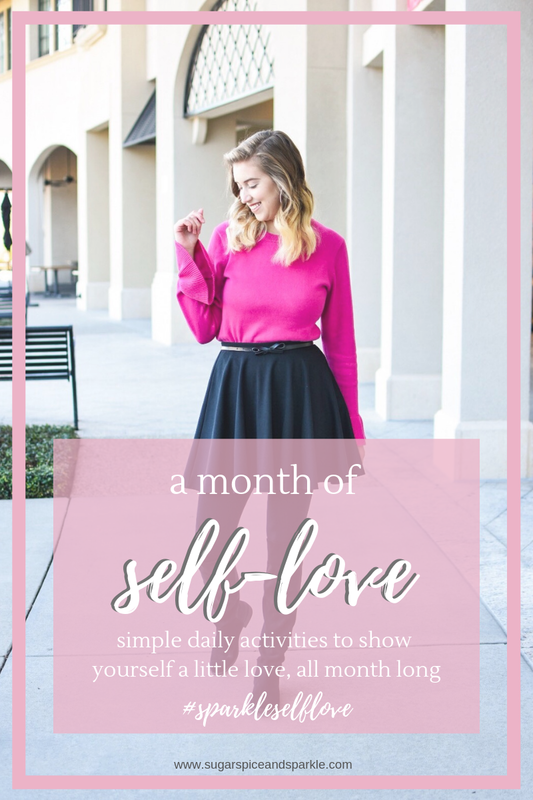 So here's the deal - I've come up with 28 simple, relatively quick, and mostly free ways to show yourself a little extra love this month; and I'll be sharing one each day over on my Instagram (@sugarspiceandsparkle if you're just joining us)! I tried to be really intentional with each of the activities. I don't want this to be extravagant or expensive or take hours a day - because that isn't sustainable! The point is to be able to do something, even if it's small, every single day. The best part is that we can do this together! If you do any of the activities, snap a pic and share on your stories or as a post and use the hashtag #SparkleSelfLove and tag @sugarspiceandsparkle so I can see! I will be sharing either a story or a post doing the activity myself every single day too! I can't wait to take a few minutes for ourselves each day, together! Every day you share a story or post and tag me and use the hashtag, you'll earn an entry into my giveaway! I'll be giving away a goodie box FULL of makeup and beauty products, similar to what I did back in December if you were around for that ;) Except this time to enter all you have to do is take care of yourself! I'll be creating a story highlight on my Instagram profile so that you can go back and see everything if you miss a day, but again, the idea is to take a little time every single day :) I'll also be sharing your stories that you tag me in with my audience so you guys can connect with each other too! Yay community! My ultimate goal with this series/challenge/whatever-it-is is to show you (and myself) how important and life changing taking just a few, intentional moments for ourselves each day can be. If you're like me then every evening when your head hits the pillow you look back on the day and think it was just a whirlwind! Like, what did I even do today?! In this fast paced world that is always on it is so so so important to try and slow down, disconnect, and just breathe. I hope these daily activities will spark you to think of even more ideas and continue to take time for yourself daily for the rest of the year, heck, for the rest of your life! SO who is excited?! Me!! Head over to Instagram right now to see today's activity (fun fact: I was doing this activity when the idea for this whole thing popped into my mind! The power of relaxing your brain for a once! ).